Bizagi supports integration with Identity and Access Management systems (i.e, Identity Managers or Identity Providers) which are SAML 2.0 compliant, such as Microsoft ADFS. This section is a step-by-step guide to configuring in ADFS and in Bizagi to have an integrated authentication in Bizagi against ADFS. For SAML 2.0, both your Identity Provider and your Bizagi project must be set up to support HTTPS. 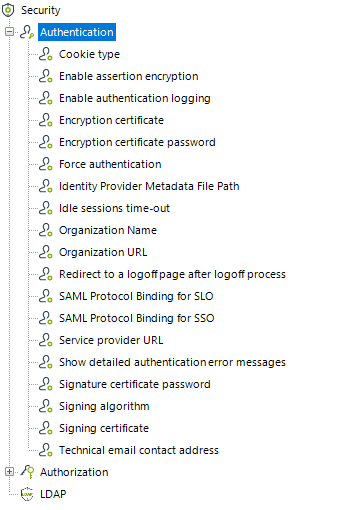 To continue, you need to be in charge of managing your installed certificates (keeping track of expiration dates and any other relevant maintenance aspects such as handling changes in your Identity Provider's endpoints). When integrating any Identity Manager, you need to synchronize the accounts that are authorized to access Bizagi's Work portal. Bizagi does not store passwords when it is integrated with an Identity Manager. 3. An installed and fully configured and supported version of ADFS. Bizagi supports ADFS version 3.0. 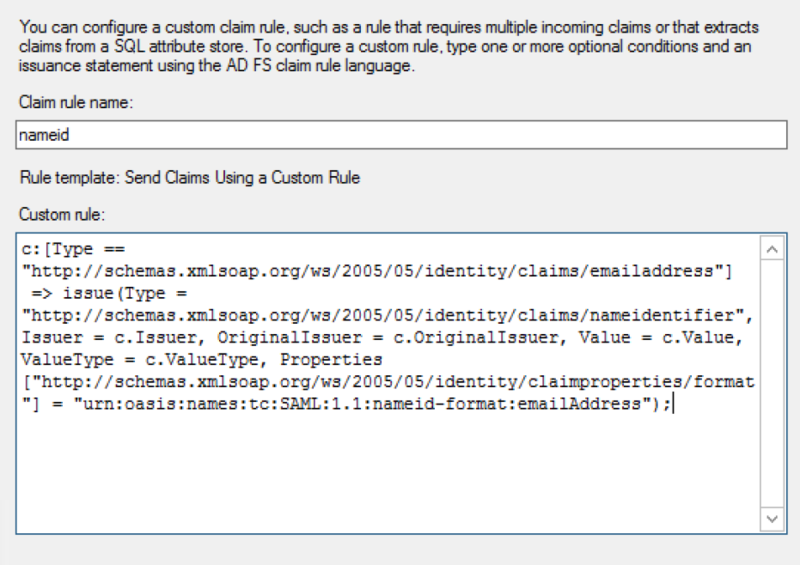 If you want to use a different version which supports SAML 2.0, check with our support team before proceeding. 1. 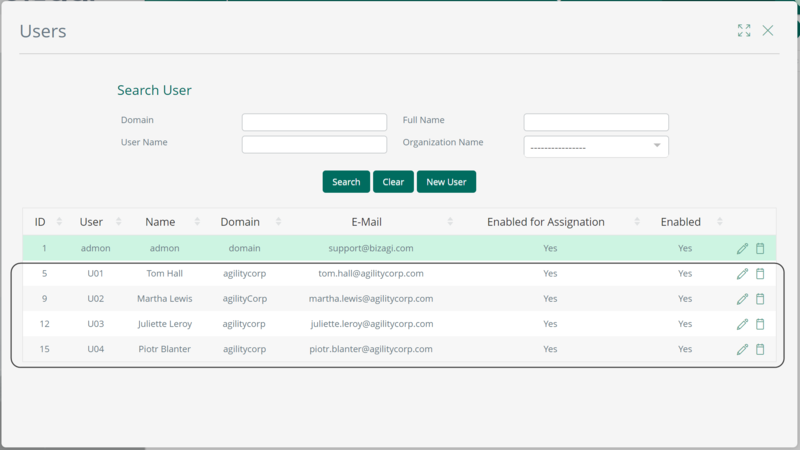 Configure in Bizagi, the settings that make reference to your SAML setup. Use the Bizagi Management Console targeting the environment you want this configuration to apply to (e.g, development, testing, staging, or Production environment). 1.1. Open Bizagi Management Console and select your Bizagi project. 1.2. Locate the Security module. 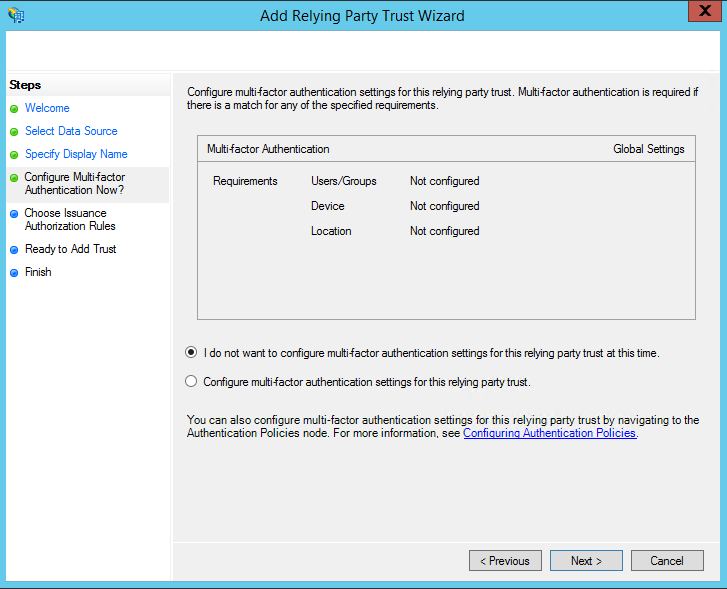 Click on the Authentication option found under the Security item. 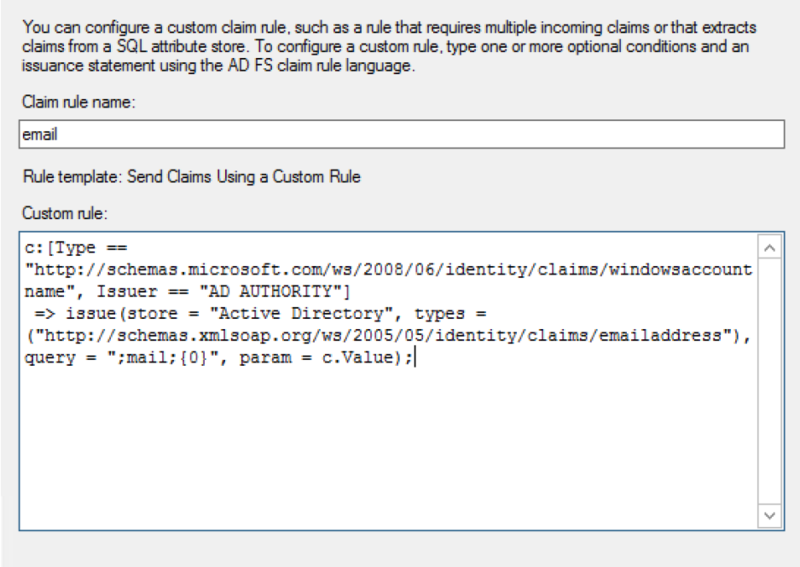 You will get a confirmation message and notice that additional parameters appear under the Authentication item. Follow the above procedure in the Bizagi Management Console. 1.3. Configure the additional parameters, making sure you click Update for each that you modify. The parameter values are case-sensitive so you must be sure to input them correctly. Provide the appropriate value for [my_federateserver]. When you are done, confirm that your changes have been applied. Authentication changes may not be reflected immediately; you may need to reset the Bizagi services. Any change in the authentication type, or any of its settings, is not reflected immediately unless the cache of the application server is explicitly refreshed. 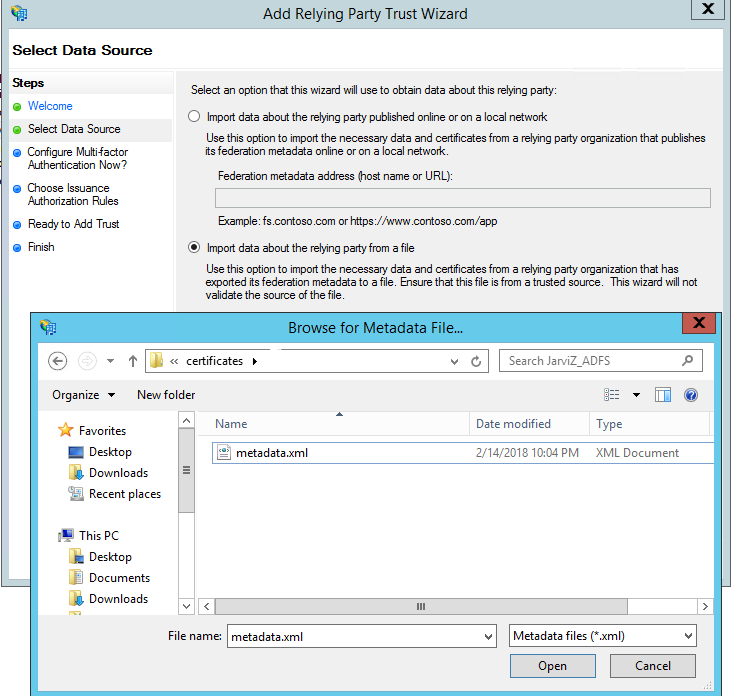 To configure ADFS throughout the next steps more easy, download the metadata file from Bizagi to a local path so you can input it into ADFS. Do this in the admin options in ADFS. 2.1. In your ADFS server, open the administration console. 2.2. Launch the creation of a relying party trust. 2.3. Select the data source. 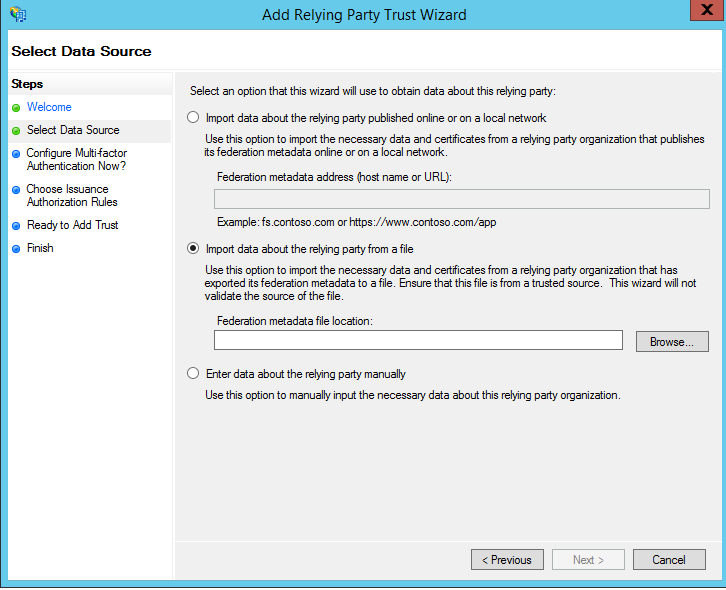 To configure the relying party, select the Import data about the relying party from a file option and browse for the metadata file generated by Bizagi. 2.4. Select the metadata file. Make sure you locate Bizagi's metadata.xml file. 2.5. Enter a unique name. Give a display name to this configuration, for your convenience. You see a summary of the information to set for this relying party trust, including the information that came from Bizagi's metadata file. You may click Next when done. You may also check (in the Advanced view) that the algorithm set for this use (either SHA1 or SHA256), matches the one configured in Bizagi. 2.8. 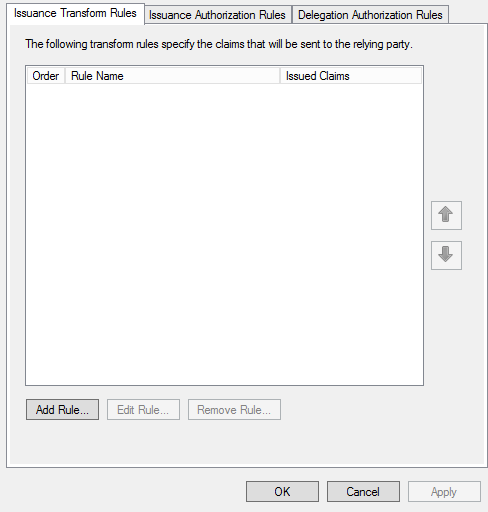 Open the Claim rules editor. 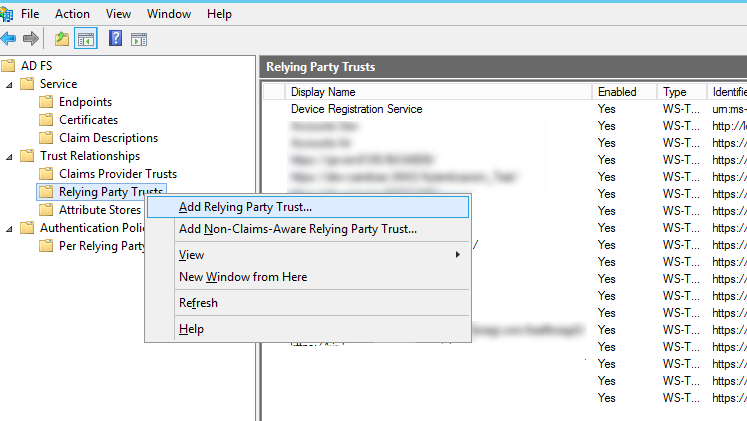 Before you close the actual configuration window, check the Open the Edit Claim Rules dialog for this relying party trust when the wizard closes checkbox. 2.9. 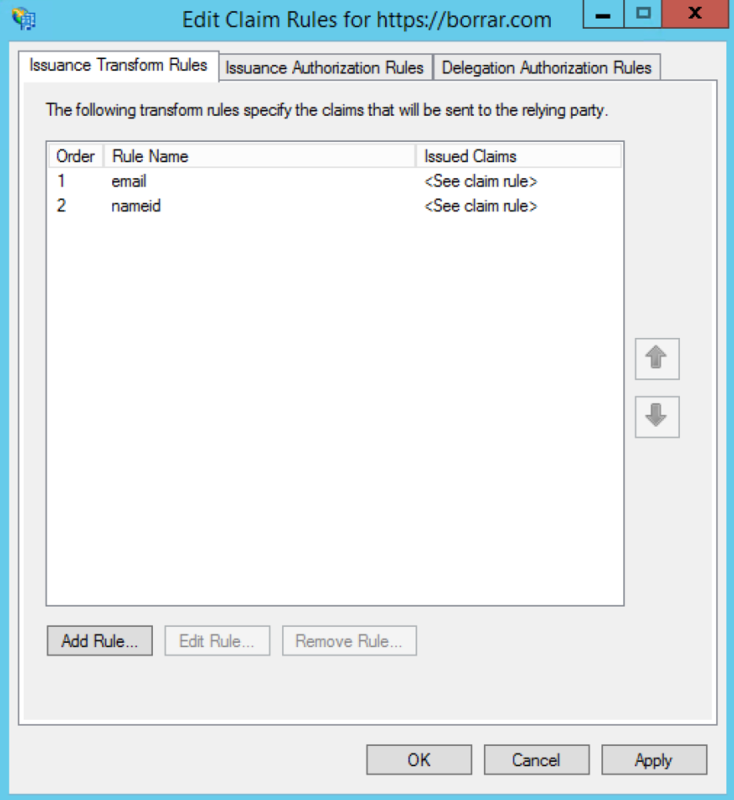 Define a new claim rule by clicking Add Rule. 2.10. 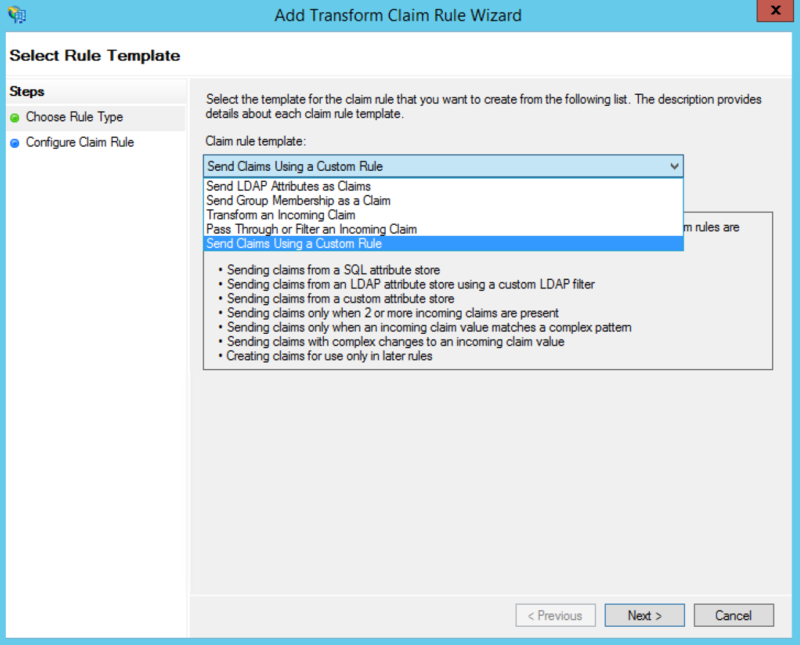 Select the Send Claim Using a Custom Rule template. When you are done, your newly created rules are displayed as shown in the image below. The rule may not be recognized right away. 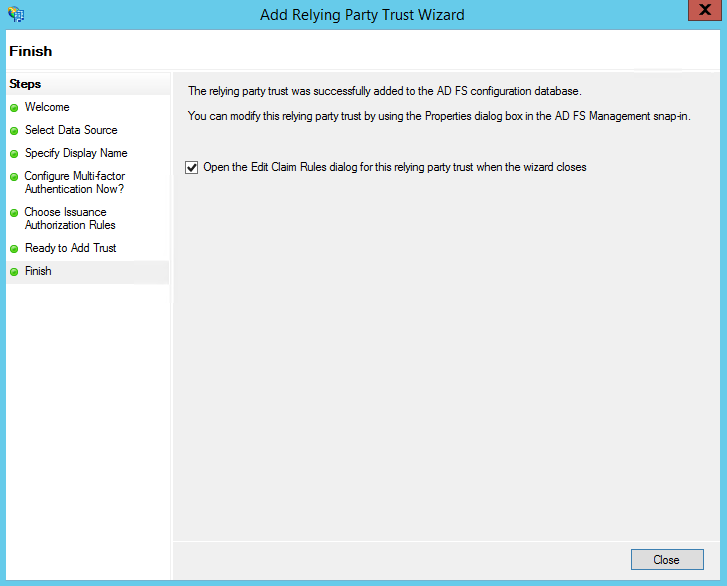 If so, delete the rule, create it once again and restart the ADFS server. 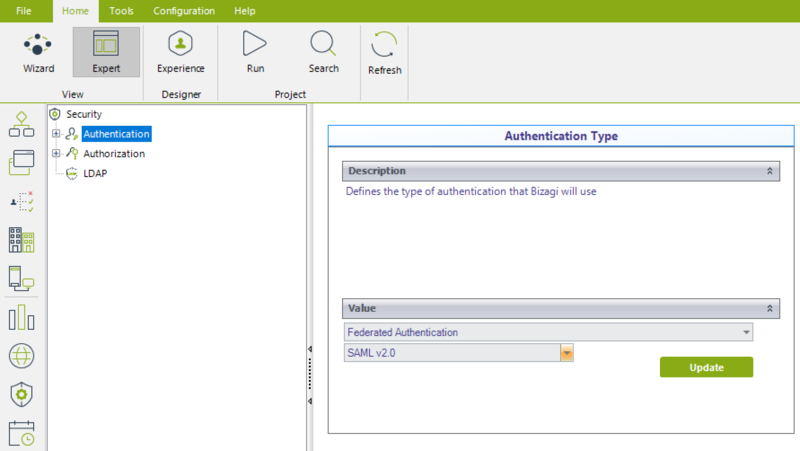 At this point you have configured your ADFS to rely on SAML 2.0 for an integrated authentication with Bizagi! You will need to carry out the next part only if you have employed self-signed certificates. 1.Access your ADFS server and open a PowerShell console. 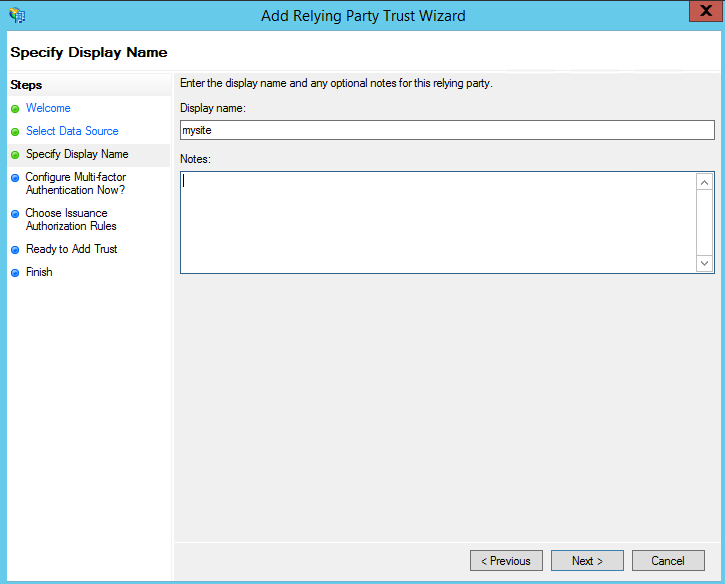 Replace [relying_party_trust] accordingly to the unique name given at the configuration above (when you register Bizagi's relying party trust).